We have heard it before: Gram for gram, fat has more than twice the calories of protein or carbohydrates, and eating too many calories leads to weight gain; therefore, people should eat less fat. Right? While reducing calories does work for short-term weight loss, sustainable, long-term weight loss is a bit more complicated. According to the The Lancet Diabetes and Endocrinology, long-term weight loss depends on how the body processes and interacts with food and all its nutrients, not just its calories. How else could moderately higher-fat diets like the Mediterranean diet (42 percent fat, mostly from olive oil and nuts) continue to be linked to lower weight and waist circumference (aka belly fat)? In a 2015 Harvard University meta-analysis of more than 50 clinical trials, low-fat diets didn’t perform any better than higher-fat diets for long-term weight loss. If you had the option, wouldn’t you rather include delicious, healthy fatty foods in your diet for a lifetime of weight maintenance? Yes, please! 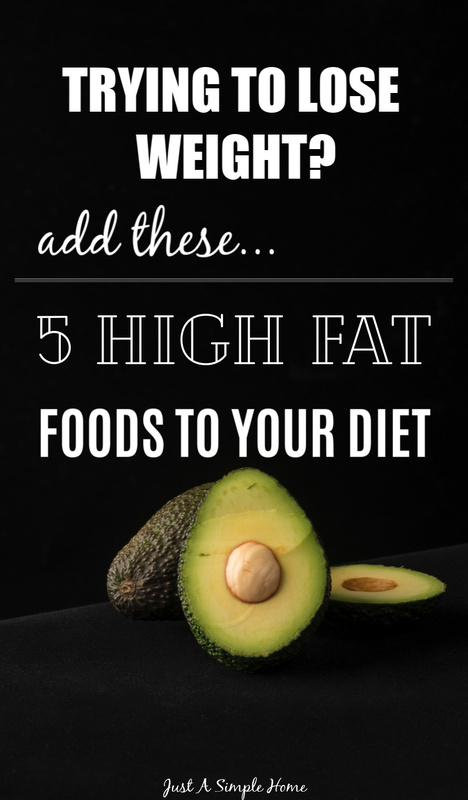 Here are five high fat foods that can help you lose weight, for the long haul. Hear me out on this, friends. I know many people cringe, but anchovies add so much flavor to food without an overpowering fish flavor. Anchovies are small, fatty fish that provide omega-3 fats, a type of polyunsaturated fat that American’s don’t get enough of. Omega-3 fats are an important part of keeping our cell membranes strong and healthy. And since the bones are small and edible, anchovies are a surprisingly good source of calcium for strong bones and teeth. Other healthy, fatty fish to consider adding to your diet are salmon, herring, mackerel, rainbow trout, and sardines. Salmon is one of my favorites; I could eat it every day if only my budget allowed! Avocados have been gaining a lot of popularity over the years, and for good reason. They used to be shunned because of their fat content. Now we know that the monounsaturated fat in avocados is healthy fat, not to mention they contain antioxidants like lutein that give it its signature green color (it’s in higher concentrations in the darker green flesh closest to the peel). Avocados may also help you feel full, according to a small study published in the Journal of Nutrition. Researchers added about half of a Hass avocado to lunch for 26 overweight adults, and tested how full it kept them for the five hours after eating. They rated their appetite on a visual scale before and after lunch, and the results show that compared to the avocado-free control meal, the lunch with added avocado kept participants 23 percent more satisfied, and was 28 percent better at keeping hunger away over the five hours after lunch. When just looking at the first three hours after the meal, which is when it’s so easy to reach for a snack, the avocado lunch did even better at controlling hunger. I found this fascinating and encouraging, as I love my avocados! Olive oil is the main fat used for cooking in the Mediterranean diet. While about 40 percent of this diet comes from fat, this way of eating could be a viable path to weight loss and weight maintenance. In a year-long study published in the Journal of the American College of Nutrition, Mediterranean diets high in olive oil led to significant drops in weight and waist circumference. While a low-fat diet also led to weight loss, the study showed that a Mediterranean diet can be an effective alternative. If you have been following me for any length of time, you’ll also know that I am a proponent of the ketogenic diet, which places a high emphasis on healthy fats. When purchasing your olive oil, realize that not all oils are created equal. There was a study done that found that most (73 percent) of the most common olive oil brands sold in the U.S. were diluted with other oils (e.g. soy, corn, canola). Those are actually the oils that you want to stay away from. The California Olive Oil Council offers an authenticity certification that you can look for on bottles of olive oil at the grocery store. The Council’s testing standards are more rigorous than international ones. The North American Olive Oil Association offers a separate seal of authenticity for imported olive oils. You can also check the harvest year on many bottles of olive oil — always buy from the most recent year available. Eggs offer satiating protein, healthy fats, and is one of the few commonly eaten food sources of vitamin D, but only if you eat the whole egg, as many of the nutrients are in the yolk. Clinical trials also suggest including eggs can help with weight management: One such study published in the International Journal of Obesity compared typical breakfast foods— eggs versus bagels. The study included a 340-calorie breakfast — either eggs or bagels — for adults either on a calorie-restricted diet or not. When participants were already cutting back on calories, eggs seemed to give them a boost —they lost 65 percent more weight. However, without the calorie controls, it was hard to see any effect. 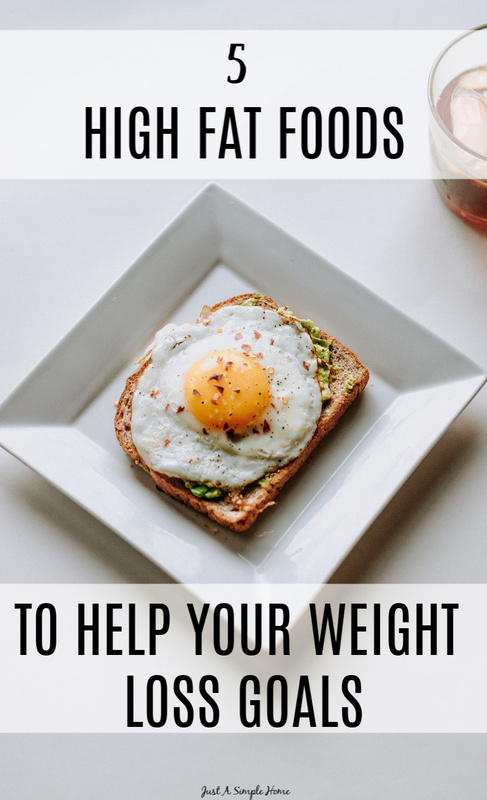 So, while you may want to watch your overall intake, and egg breakfast may help you with your weight loss goals even faster than the typical carb heavy breakfast. We have known for awhile that nuts are heart-healthy, but now there is research to suggest that they are weight friendly, as well. In an observational study reviewing past eating habits for 14,386 people, those who ate at least 1.75 ounces of nuts per week tended to have a lower body-mass index and waist circumference. The study included several kinds of nuts: almonds, Brazil nuts, cashews, hazelnuts, macadamias, pecans, pine nuts, pistachios, and walnuts. In a one-year clinical trial, subjects assigned to eat a Mediterranean diet with added nuts had a reduced waist circumference, too. The even better news is that this study did not restrict calories, which means these results are a lot more meaningful for everyday life. Eat fat! Seriously though…worry less about calories and don’t be afraid to eat some high fat foods. This does not mean it is a free for all; you do need to choose wisely and make sure to eat a variety of nutritious foods. These five foods here are great options to start with. If you want more information on following a Keto lifestyle, you can read more about that. If you would like some help with your fitness or nutrition choices, you can register for my free health coaching and I will be in touch! WE ALSO HAVE A FREE HEALTH AND WELLNESS GROUP FOR MOMS WITH MINI CHALLENGES EACH MONTH, SO JOIN US! Great list of high fat foods. I like everything on the list except for the anchovies. But, I may have to give them another chance. 🙂 I can eat avocados like candy. They are so delicious! I love all the foods, except for the anchovies. Eating better is one of my goals for 2019, so I definitely need to be more consistent about eating the foods. Especially since they make great snacks. I need options for snacks and my goal is to loose some weight so im gonna try these! I eat all of those daily but anchovies. Just can’t do it–ha ha! Sometimes I find that my diet gets too heavy on the fat content-even the good kind and then I have to adjust a little. This is great news! I love 4 out of the 4, and of course, love the flavor of Anchovies. Both of my boys eat them, but I just prefer to use them as a flavoring in other foods. Hey Ingrid! That’s a myth, which I why I shared this post. Eating healthy fats can actually help you lose weight. I shared a lot of links in this post that you can check for more research. I have followed a high fat, low carb diet and lost 70 lbs this year! Great list! I am currently in an egg phase when I want eggs every single day. I love them sunnyside up!